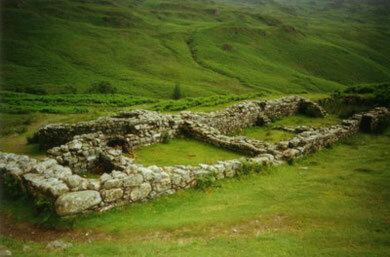 Mediobogdum (Hardknott Roman Fort) - office23s jimdo page! 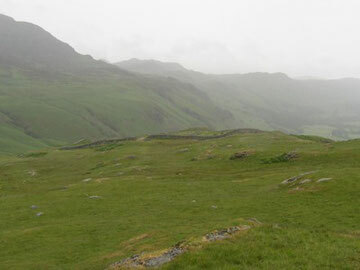 The 1.2ha fort of Mediobogdum is very remote, built in a supurb and dramatic situation at the head of Hardknott Pass, surrounded by spectacular scenery. it was built in the late 1st century AD to control the pass and to improve communications with the Cumbrian coast; its most important feature is the large (1.2ha) parade ground to the north-east which, through an impressive feat of engineering, was levelled out of a boggy hillside; it has a big tribunal on its north side. The fort had double gates on its three exposed sides (south, east; west) and a bath-house outside to the south. Occupation did not last beyond the 2nd century AD. The Romans originally built a road over the pass in the 2nd century AD to link the coastal fort at Ravenglass with their garrisons at Ambleside and Kendel. The Romans called this road the Tenth Highway and it reaches a height of 393 m (1289 ft) at the top of the Hardknott Pass before descending steeply to the Duddon Valley and then ascending and descending the Wrynose Pass (also 393 m) on its way to Ambleside. The road fell into disrepair after the Romans left Britain in the early part of the 5th century AD, although it remained as an unpaved packhorse route throughout the centuries. The Ministry of Defence used the area for tank training during the Second World War and this completely destroyed the ancient track. After the War a decision was made to repair the damage and rebuild the road with a tarmac surface to give a direct motor route between Ambleside and Eskdale for the first time. However, the Roman route and the modern road do not generally coincide, the Roman route lying generally to the north of the modern road west of the summit, and to the south on the other side.